Exactly what I went in for and nothing else. True, I stroked the yarn and I hovered by the bargain bucket for a good while, but I was good. 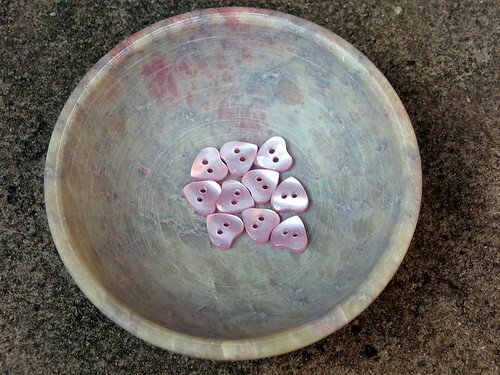 These sweet little buttons are intended to embellish a pair of simple mittens I'm working on at the moment. 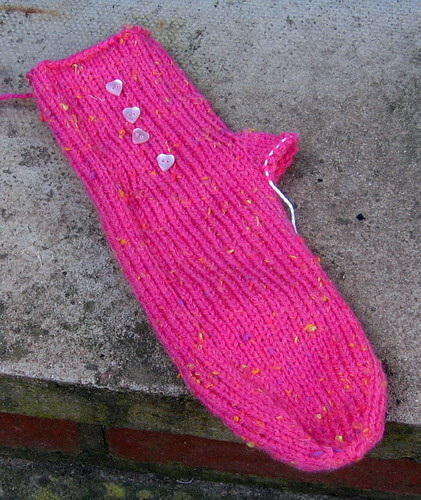 The pattern is Easy Mittens (Ravelry Link) from 101 One Skein Wonders using stash yarn. So far I've made one, minus it's thumb and cast on for the second one. 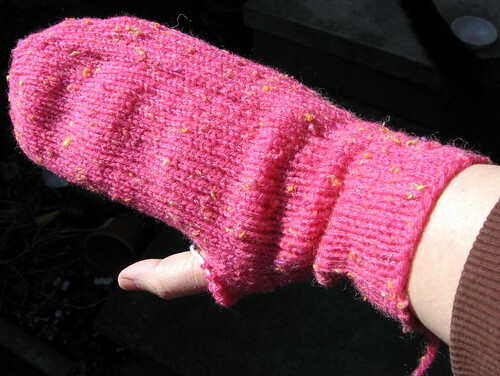 The mittens were started as a portable and easy project, acting as light relief for the lace shawl, which still lumbers on (21 repeats of the border and counting). They're intended as a Christmas present, which is just as well as while I'm knitting the large size, they're turning out a tad small for my liking. This isn't exactly surprising as I have large hands with long fingers and shop bought gloves never fit. Ladies gloves always being too small and mens gloves always being too big. Pretty, girly and pink, just what I'm after. I don't think glove manufacturers think that there are too many people with long pianist fingers. M&S seem to be my best bet for shop bought gloves that fit, but that's unfortunately rather limiting. I've just had to get used to getting leather gloves, and stretching out the fingers over time.